Email messages without subject lines — grrrr! Among the most peevish of my pet peeves are email messages that have no subject line. Why do people send them? I know, I know, it’s generally accidental. Unfortunately, not all email applications warn users when they’re sending a message without a subject line. While most do warn, often you can set a configuration preference to disable such warnings. The graphic is of the pop-up message that Mac Mail provides. As far as I know, there’s no way to disable it the alert. Good! Memo to world: Sending email without a subject line is pretty rude. Subject lines help us find messages in our inbox, and also let us link threads together. Test your email software to make sure that it warns you. If it doesn’t, check your settings to turn that feature on (or back on). Memo to my friend Nancy, who always uses the subject line “from Nancy”: That’s just as bad! I already know that the message is from you, since I see your name in the “From” field. I have a hundred messages from you, on multiple threads, and they all have the subject lines “from Nancy” or “re: From Nancy” — stop it! https://alanzeichick.com/wp-content/uploads/nosubject.png 100 320 Alan Zeichick http://alanzeichick.com/wp-content/uploads/alan-zeichick-logo.png Alan Zeichick2008-11-25 15:28:002016-06-30 18:13:46Email messages without subject lines — grrrr! 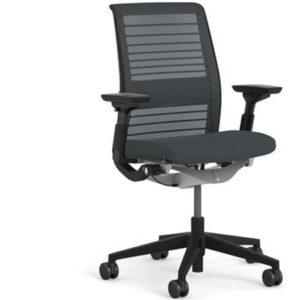 I am consistently amazed at how comfortable my Steelcase Think office chair is. For years, my back had been sore and stiff if I sat in front of my computer for more than an hour or so. In early 2005, I mentioned that to a friend, and he said, duh, buy a better chair. I guess it was time to replace the task chair picked up second-hand 15 years earlier. My search was exhaustive: I was willing to spend serious money to get something good. After visiting several “real” office furniture stores – places like Office Depot, Staples and Office Max have a lousy selection, imho – I fell in love with the Think. Some even pricier chairs I tested, like the Steelcase Leap and the Herman Miller Aeron, were much more complicated, and much less comfortable. With an Aeron, I literally can’t find settings that work. With the Think, it only took a minute to find the right settings, and I haven’t changed them in the past 2 ½ years. While I can’t claim that the Think is the best premium office chair, I believe that this is the best investment that I’ve ever made in my work environment. I paid about $700 for it in 2005 at an office furniture store in San Francisco. There are a few different versions available. Mine is the original model with mesh back, cloth seat and adjustable arms. Today, Steelcase also offers leather or vinyl coverings, fixed arms or armless, and optional headrests and lumbar supports. That makes it complicated again! When I got mine, the only option was fabric color. I chose black. So, if you sit at your desk/computer for hours at a time, and if you’re using a cheap task chair, consider an upgrade. Try the Think — maybe it’ll work for you, maybe it won’t. (My wife tried mine out, but didn’t care for it.) The important thing is that you get a good chair that fits you well, and is comfortable. If you’re sore and stiff, duh, buy a better chair. What color is your automobile? Silver, perhaps? According to this article by the Evening Times, silver is the most popular color for cars. It shows a desire to be seen as having wealth and prestige. What does your car color say about you? My wife and I have only purchased one silver car, a Ford Tempo. At the time, we weren’t seeking to flaunt wealth or prestige. Just the contrary: We were getting a bargain on a left-over. 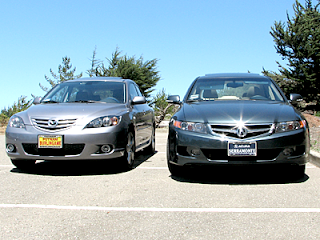 Our current fleet (pictured) consists of my Titanium Gray Mazda3 hatchback and my wife’s Deep Green Pearl Acura TSX sedan. According to the story, gray is a sign of stability and reliability. Green is for those who are conscientious and try to smooth over tense situations. Works for me. http://alanzeichick.com/wp-content/uploads/alan-zeichick-logo.png 0 0 Alan Zeichick http://alanzeichick.com/wp-content/uploads/alan-zeichick-logo.png Alan Zeichick2007-10-01 19:18:002016-06-23 09:25:57What color is your automobile? Silver, perhaps?